Bael the Corruptor is an Archdevil of wide repute. Planar scholars know him as Lord of Silence, a potent foe of all Divine powers and a corruptor of the pious. Having conquered the planet Perruush, he has sculpted it into a mockery of the temple complexes and acropolises of mortals. Lord Bael commands three grand armies of the best-trained Barbhast Devils that Hell has to offer – it is widely said that he was promoted from within their ranks. The Archdevil cannot speak, as his tongue has been torn from its roots. Tales say that he slew a conclave of ancient Demon Lords of great persuasive ability to cement his power in Hell and achieve promotion, at the cost of his tongue. What is known is that the demonic heads he carries speak when the Archdevil wishes to communicate or command, and that the fiend himself cannot otherwise speak aloud. Whenever possible Bael leads his armies from the front, wielding a huge and storied morningstar known as Namurii – a relic that shows signs of having been re-forged at least once. His military units are usually comprised of small cadres of Barbhast Devils led by corrupted priests for magical support. The Corruptor’s low-level Masters are veteran Barbhast Devils, pretentiously referred to as Imperial Devils on Perruush, who have shown strong tactical aptitude on the fields of battle. His Over-Masters, the Priests and Bishops, are drawn from the twisted “seminaries” that dot the barren surface of Perruush, their mortal bodies corrupted to the point of being unrecognizable. Their pupils, the Acolytes, are zealous supplicants who have had their tongues permanently removed to be used in staves of power. Bael is also known to be the Outsider Lord that created the devolved Heavenly race, the Oubliette Devils, in an event referred to tongue-in-cheek in Hell as the “Battle of Wills”, though the circumstances of that event and the origin of those haughty fiends is known by only a few. Lord Bael’s legions are deployed most often against the forces of Heaven and the semi-divine Piper race. In contrast, his efforts against the lesser servants of righteous religions found throughout all mortal worlds seldom require military force, such campaigns being effectively pursued with more subtle corruption. When the way has been sufficiently prepared, Bael has been known on a few occasions to travel himself to worlds at the very vanguard of his personal wars. His arrival is heralded by a great silence spreading through the ranks of his armies, and the ear-splitting keen of the Priests’ and Bishops’ skull-tipped staves as they summon their Lord. Unlike many of his peers in Hell, Bael is in no way a physically attractive creature. His face is always contorted with barely-contained rage, and few will look directly at him for fear of inviting his ire, and the mind-seizing power of his voice. Bael’s epithet is derived from his unique manner of speech – the Corruptor has no tongue in his mouth, but rather speaks through the shrunken severed heads of four humanoid demons. When he utters commands through his intermediaries’ mouths, they become irresistibly endowed with a compulsion that is almost impossible to refuse. Exiled from the Hellion System-proper to the conquered world of Perruush, Bael spends much of his time corrupting enslaved priests at his seminaries. He wickedly enjoys using his abyssal voices to politely ask prisoners and lesser devils to torture, maim, and kill themselves. Often the first thing he compels the victim to do is tear out their own tongue by its root, bare-handed. Bael himself stands as tall as a large war horse, average for a greater devil. His indigo skin and yellow-white mane make his visage striking at first, and terrifying at a second glance. 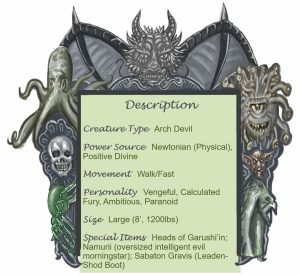 The unique form granted to him by Asmodeus is for some reason imperfect – his broad and powerful frame is marred by mismatched feet. One is a cloven hoof, as possessed by many a devil. The other is a humanoid foot in a heavy-shod boot. Each is perfectly functional, but which is the defective appendage is the source of much idle chatter amongst the other Dukes, and the reason for his deformity even more so – for Asmodeus makes no mistakes. Despite his limp, Bael is physically gifted, capable of making great leaps and running far faster than any mortal. He also brings two potent magical abilities to bear: from his own lips a peal of utter silence that disrupts the use of divine magic, and a powerful ground-shaking stomp channeled through his leaden, armored boot. His corporeal form is, like all devils, built more from mineral matter than t soft, weak organic stuff of mortal flesh. Regardless, the Lord of Silence is rarely seen unarmored, favoring scale or chainmail and a heavy cloak. Each of these items is imbued with ancient sorcery bestowing secret defensive capabilities. He keeps one or more of the severed demonic heads on his person at all times, and Namurii is slung over his shoulder when not in his grasp. 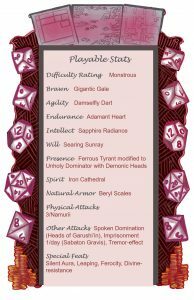 Off of Perruush, he is usually accompanied by a highly accomplished female Oubliette Devil archmage, though little is known of her identity or history. Bael has few other close associates and no known consorts; he lacks the poise and restraint of most other Archdevils, and his ritualized rages leave corpses piled around his galleries. For all his carnage, however, Bael is never reckless – he is one of Hell’s finest tacticians, and his banishment to ‘foreign wars’ is as good for Hell’s empire as it is a vexation to The Corruptor himself. Most stories about Bael somehow involve the acquisition of his demon heads. The facts in their entirety are not known, except in the broadest strokes. He slew the demons long ago, while still a rank-and-file Barbhast Devil captain, at the end of a bloody campaign against the Thrall Legions of Perruush. His use of blanket incendiary weapons on the City of the Mindless is still considered to be one of the greatest military actions in Hell’s recent history. Having been promoted to Dukedom by Asmodeus and gained an advanced and powerful form, Bael took the conquered world of Perruush and made it his personal fortress. The planet is overrun by his armies of Imperial Devils constantly practicing maneuvers or slaying the remaining, nigh-inexhaustible population of Thralls left over from the Demon Lords’ army to supply the devils’ mess halls. The heads themselves are rumored to be alive and conscious – but no one is sure. Perruush is a planet well-suited to the legions of Hell. Heavy volcanism has filled the atmosphere with significant levels of hydrogen sulfide, giving the entire world the brimstone reek that many mortals associate with Hell. Vents and giant rifts release large quantities of the gas, changing it from an eye irritant and cause of perpetual fatigue into a dangerous blinding poison that fills the lungs with fluid. Carbon monoxide, too, laces the stinking air; visitors are well-advised to carry a source of air with them, and never to sleep below ground level where those gasses accumulate. The planet is also very rich in metals, in the form of both valuable ores and veins of raw material. 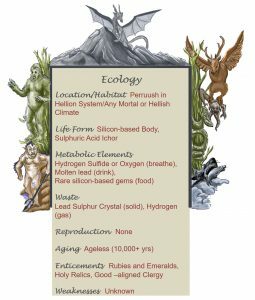 The element lead in particular pervades every part of Perruush, making extended visits by mortals untenable; humanoid flesh begins to break down from the assault of multiple poisons after as little as a month, that is if the flora and fauna haven’t killed the traveler first. Bael’s legions are as immune to those foul vapors as are other creatures of the Hellion System; Bael himself differs in that he is also able to breathe easily in the sweet air of more temperate planets. As if its atmosphere were not enough, Perruush also mirrors its master’s vituperative humors; sages have reported black flesh-scouring haboobs of galena crystals big enough to be seen from orbit, and even true rains of molten lead that coat and cook all unfortunate enough to be caught below. The Lord of Silence’s personal palace is carved out of three identical huge silver-black monoliths that loom over a continent-sized blasted plateau of bare black stone. This tripartite citadel and its grounds are called Galen, after the astoundingly large deposits of crystalline galena therein. The plain is dotted with outcroppings of perfectly-formed cubic crystals, and these are sometimes sculpted into leering faces to warn off intruders into the Duke’s personal realm. Some of these faces have been seen to rise from their resting places on black crystal bodies to attack intruders to the Corruptor’s realm. Bereft of easy food or any water, Galen is the harshest area of the planet surface and the de facto training ground for Bael’s legions. As an Archdevil’s personal demesne, Galen may respond to his whims; through great effort over long stretches of time, the Corruptor can shape the very rock with the force of his will alone as long as he stands on a galena outcropping. His senses, too, are amplified. It is known that Bael possesses some form of magical sense that allows him to detect the use of divine magic- within Galen this ability is magnified, allowing the archdevil to determine the nature of the spell being cast and sometimes even to scry upon its caster. Like all of his kind, the Corruptor knows that his palace and surroundings are where he is most powerful, and few who wish him ill will encounter him elsewhere. Bael spends most of his time, resources, and energy in conducting wars against the servants of the Divine. These are wars of both infantry and intrigue; he perpetually maintains a military vendetta against the Piper race and the forces of Heaven, while simultaneously sending agents to infiltrate and corrupt mortal religious organizations of all kinds and descriptions. His war against the Pipers extends throughout known space, with his legions making regular shock orbital drops and vast magical assaults on Piper colonies, and attacking the species’ curiously impossible-looking organ-ships. To date, this pursuit appears to have largely ended in stalemate, as the Pipers are almost always unmoved to do aught but defend themselves and yet are powerful enough in concert to resist much of what Bael has to throw at them. Nevertheless, the Corruptor perseveres- and has actively denied the Pipers access to dozens of colony worlds over a long military career. His attacks on the bastions of Heavenly Angels are ever vicious and persistent despite their failure. Meanwhile, infernal spies such as Oubliette Devils and Impish face-takers work from the inside to debase the religious institutions and organizations of hundreds of mortal worlds. Bael’s agents work tirelessly to sow discord within and between mortal religions, with the eventual goal of seducing their clergy to his cause and dismantling the organization as a whole. A typical scenario is for his agents to rise to positions of power over the course of several years, begin to slowly change dogma and corrupt the younger priests, and then eventually either convert the faith into a cult that serves the interests of Hell or destroy it from within and take the souls of the fallen to their master on Perruush. In the latter situation, Bael’s servants often take the victims, body and spirit, with them back to the Hellion System to be consumed – or reprogrammed to join Bael’s infernal Priesthood. The souls, bodies, and prisoners are brought to the Duke’s palace on the Plain of Galen, where utter silence reigns. Uttering a word in Bael’s inner sanctum is a crime punishable by death, or far worse, for even his own soldiers. His throne room and other major chambers are lined with the writhing bodies of those who have spoken in his halls or displeased him in their service; all of those unfortunate creatures are cut in half, forced to consume their own legs and tongue, and woven into a grotesque carpet of writhing flesh and entrails. Bael himself takes great joy in treading on his “carpet”, whether he is trampling the weak or being borne on the hands of the strong. This punishment also does a great deal to unnerve visiting dignitaries. More than one ambassador has lost the contents of his stomach in the Archdevil’s presence. Paladins are rumored to suffer tortures even more hideous still, but of these there are only whispers. The Lord of Silence is a general well-suited to the forefront of battle. 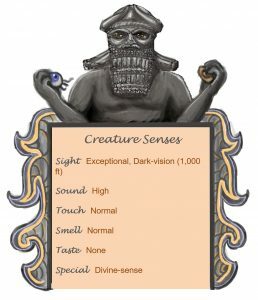 On Perruush he is normally found in his palace, surrounded by elite diabolic guards and extensive magical protection created over the course of centuries of paranoiac rule. His audience chamber, for example, is filled with virulently poisonous nerve gas which affects all carbon-based lifeforms, but to which he and his most Hellborn guards are immune. The palace as a whole is also dimensionally stabilized through a magical field, barring access or egress through teleportation or dimensional translation effects. Inside his palace, Bael usually deals with intruders directly just as he does prisoners, forcing them to destroy themselves as grotesquely as possible. No known army has ever attempted to invade Perruush since Bael’s own campaign centuries ago, but the planet fairly bristles with surface-to-orbit mass-driver defense systems and magical artillery orbital defense platforms. Away from Perruush in pitched battle, Bael is silent, leaving his heads in his belt. The Duke uses his exceptional footspeed and athleticism to make decisive strikes into the heart of enemy formations, preferring to destroy or stun groups of foes with a ground-shaking magical stomp before entering single combat with enemy leaders. Namurii itself thirsts for blood and smeared gore, so most contests are ended with the near-decapitation of his target. Some learned scholars believe this weapon transfers the life-force of its victim directly to Bael. 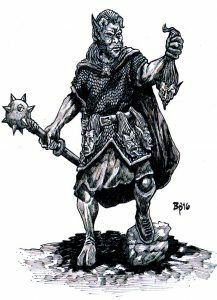 He uses little in the way of true magic, though he has occasionally been observed to employ direct manipulation of the earth and stone beneath the feet of his enemies, disrupting it to slow the fast and kill the weak. He also takes great satisfaction in causing lesser foes mortal wounds and allowing them to lay in agony and fear until his own soldiers arrive to execute them. The Corruptor is easily provoked, and is often seen to slay his own when they obstruct his path to a target, or enter a blood vendetta, ignoring wounds outright in pursuit of an enemy. Given multiple targets, he will usually select a priest or other divine magic-user, employing his strange silent utterances to cut them off from their source of power and revel in their despair before he moves in for the kill.